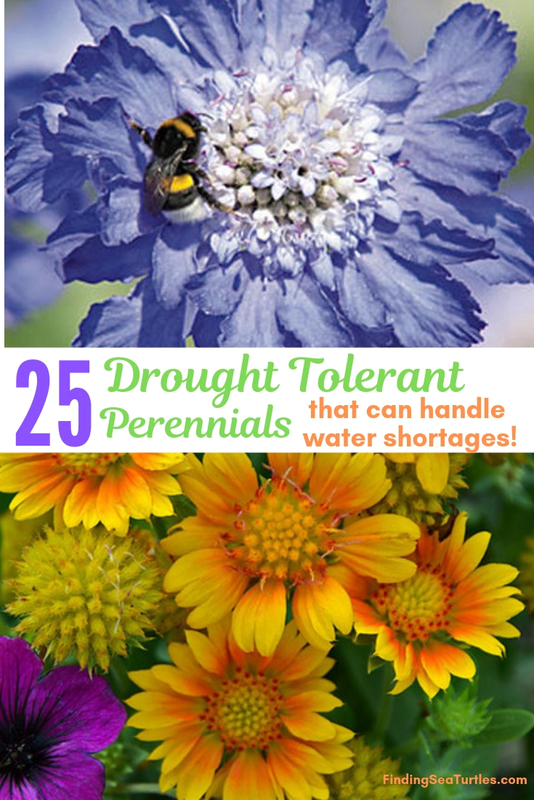 25 Drought Tolerant Perennials That Can Handle Water Shortages! Searching for plants that get by with less water like drought resistant perennials? Plants that thrive and still look amazing! And the best part is they need less frequent waterings than other plants do. Interested in a colorful garden? But holding back because the whole watering thing is an issue. There are many reasons plants and gardens can’t be watered regularly. Some reasons are due to cost, water restrictions, lack of time or water. Using the right type of plants can solve a water shortage problem. Plants that once established survive and ultimately thrive in the garden. There are many reasons that plants fail. Some reasons are due to watering issues, plant location, excessive Summer heat, and damage during transplant. Watering issues such as lack of water or over watering can lead to plant stress and even loss of the plant. Lack of water occurs for several reasons. Some communities have drought conditions. These communities may have water usage restrictions. In severe drought cases, gardens and lawns can not be watered. In these communities, homeowners may face penalties for watering their yards. Some gardeners lack the time to properly water their gardens. People who work long hours or have a long work commute don’t have time to water their lawns. Some have large families to care for. In some cases, free time is limited or non-existent. Another group of people lead frugal lifestyles. They choose not to water their gardens. Those with frugal lifestyles do not water their landscape to avoid spending money. Frugal people will wait for rainfall to water their gardens. And then there are people who are away from home. Some people are away for extended periods of time. These are people who are absentee homeowners. Or people who travel frequently for work or other reasons. Their gardens may suffer due to neglect. Another water problem is over watering plants. This can lead to problems just as under watering plants. Over watering plants or plants with poor soil drainage can cause plant roots to rot. Some plants will suffer due to excessive water conditions. Water retention in soil can be just as damaging as lack of watering. It is important to follow the grower’s planting instructions. Planting instructions are usually found on a plastic tab in a new plant’s soil. Planting a shade loving plant in full Sun will lessen your chance for a successful transplant. Just as planting a Sun loving plant in a shady garden area can prevent the plant from establishing itself. Likewise, select the right soil conditions for a particular plant. Understand your garden soil conditions. And select plants that suit your soil conditions. Or modify your soil to accommodate the plant’s soil requirements. As an example, plants that will thrive in clay soil may not do so well in acidic or sandy soil. Plant location is important. Plant according to the grower’s instruction for the right light requirements and right soil conditions. Intense sunny garden locations can damage plants or cause stress, if plants are heat intolerant. Plants can be weaken if exposed to extreme heat temperatures when they are unable to tolerate heat. Plant the right plants in the right soil conditions and right light requirements. Avoid unnecessary stress to your plants. Handle new plants carefully when planting in the ground. New and younger plants are not as tough as older mature plants. As you handle younger plants avoid damaging any branches or stems as you place it in the ground. Damaging plants causes stress which can weaken the plant. Stress can delay the time the plant settles into the garden. Or in extreme cases, it can lessen its chances for survival. To help plants settle in, we only plant new plants at certain times. We plant new plants in the early morning or late afternoon. And we select days that are cloudy or with light rainy conditions to plant. This gives new plants time to settle in before being exposed to a full day of Sun. Generally, we add new plants in the Spring or Fall season. Preparing your planting schedule carefully gives new plants a jumpstart on settling in and becoming “established”. By selecting cloudy days to plant, you can improve the new plant’s chances for surviving. After new plants are planted in the ground, water thoroughly. Water new plants according to the grower’s instructions. Some recommend once or twice a week for the plant’s first year. This initial work will pay off in the long run. Once the plants are established, they require less work. So add color to your garden. 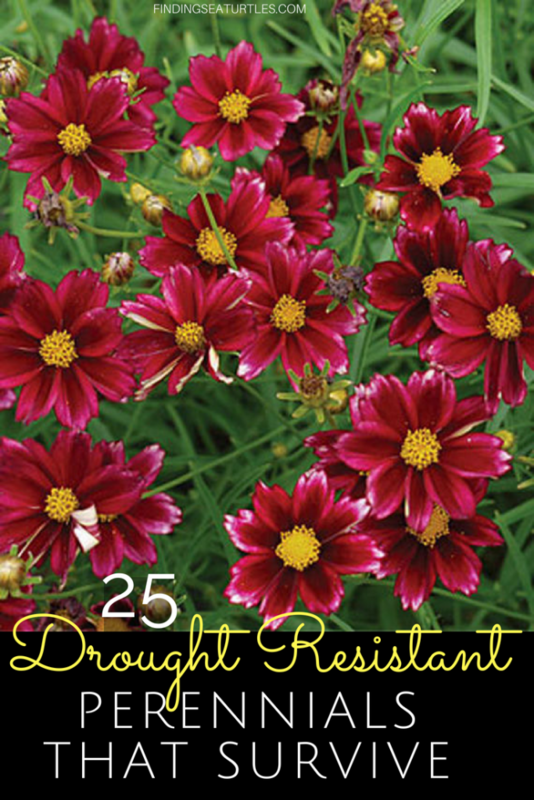 Plant perennials that are drought resistant once established. 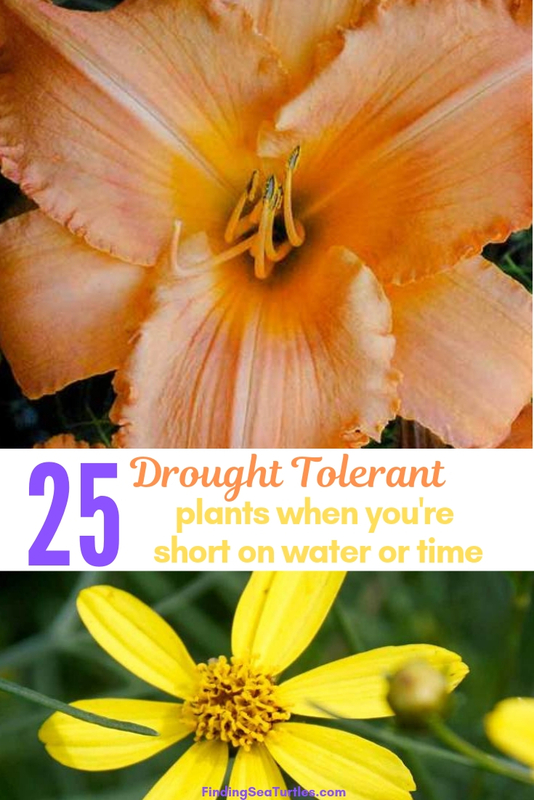 No need to avoid plants due to water restrictions or shortages when your plants are drought resistant. Enjoy your garden and have less frequent waterings. 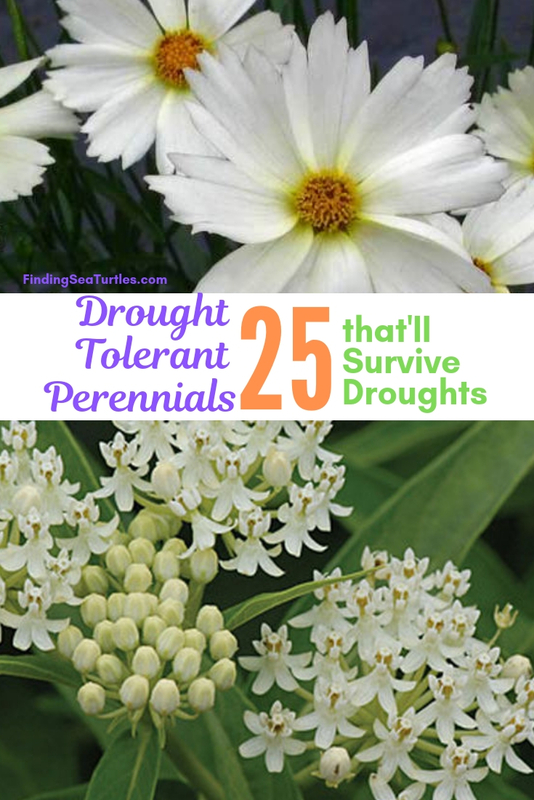 Drought resistant perennials thrive with less water. 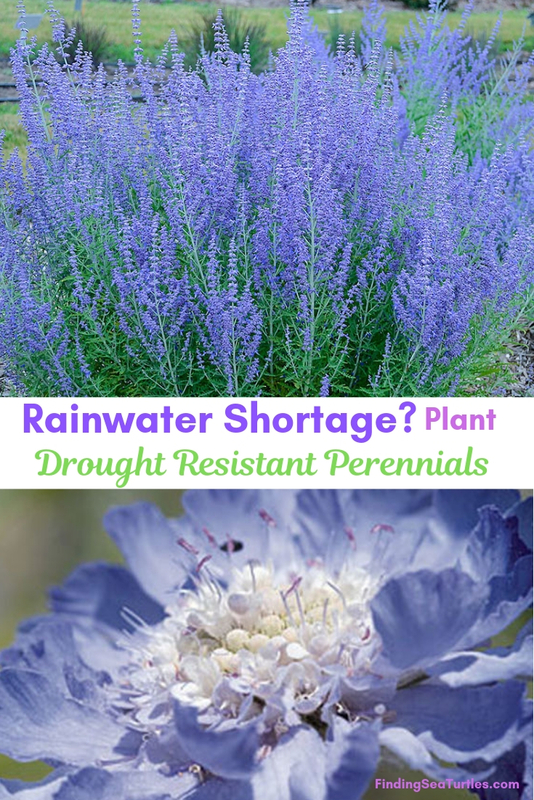 Whatever the reason for considering drought resistant perennials, the choices are many. As you will see so many to select from. Blooms in a variety of colors to suit many gardener’s preferences. Consider adding color or a little drama to your garden with drought tolerant perennials. 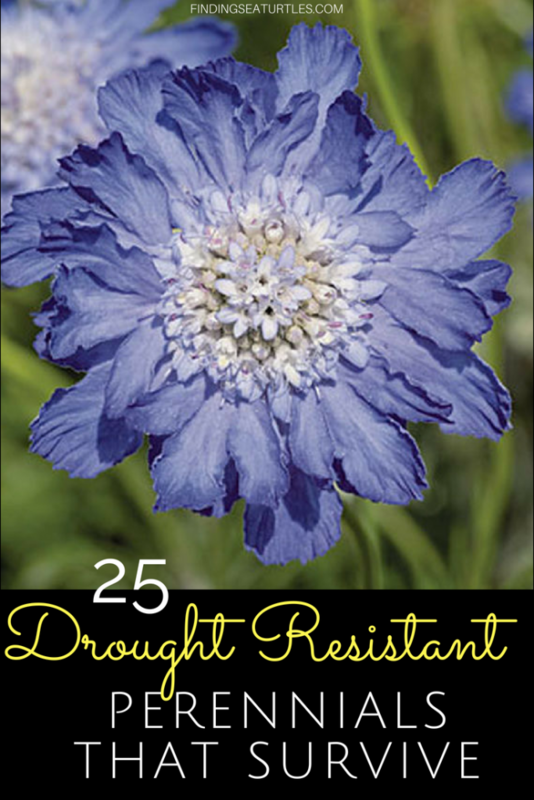 We’ve gathered 25 drought resistant perennials that won’t disappoint you. 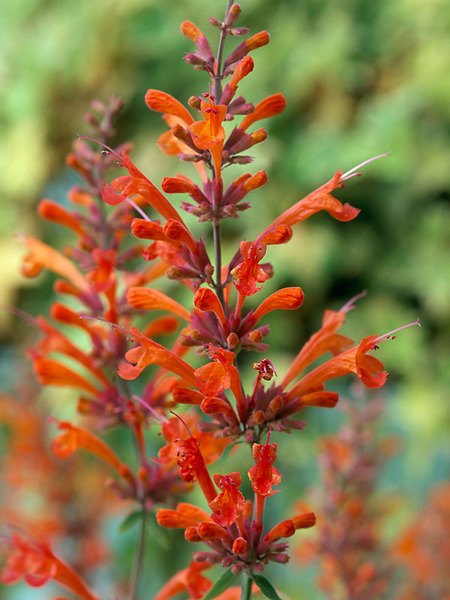 These drought resistant perennials come in a variety of colorful blooms. Take a look and let us know what you think. 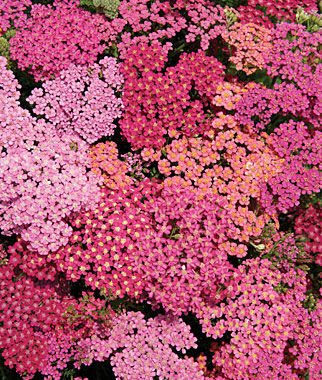 The Cherries Jubilee Achillea is also known as Yarrow or common Yarrow. Cherries Jubilee is a four plant mix of bright reds, rose, and violet colored plants. The yarrow mix blooms late Spring and Summer. This extended blooming period makes for some excellent cut floral bouquets. Grows in zones 5 to 8 in full Sun. Tops out between 24 and 28 inches. A deer resistant and drought tolerant perennial. Use Cherries Jubilee in garden beds and borders, for fresh cut flowers or in dried floral arrangements. The Rosie Posie Agastache perennial is also known as hyssop. Hot pink blooms appear from early Summer to early Fall. Attractive bright green minty aromatic foliage is a nice contrast to the pink blooms. An easy to grow perennial. Grows in zones 6 to 9 in full Sun with well-draining soil. Reaches 18 to 22 inches in height. Resistant to deer and drought tolerant. Bright colorful blooms draws crowds of birds and butterflies. Plant Rosie Posie in garden bed or borders. 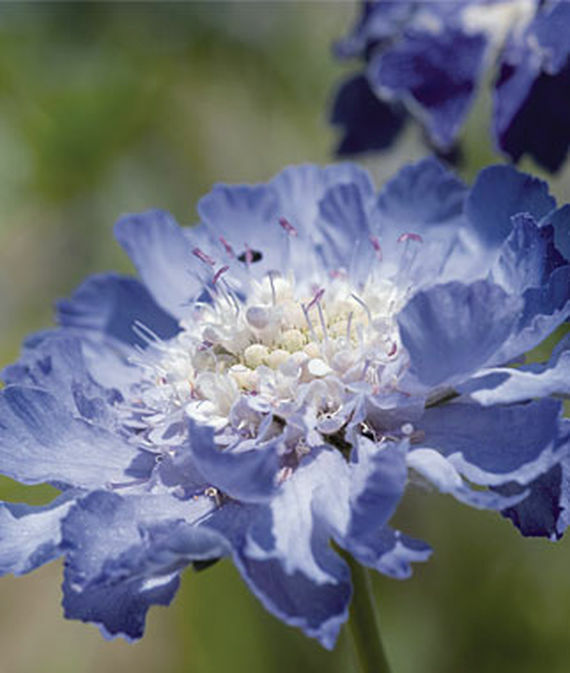 Blue Jean Baby has blue purple blooms on lacy, silvery green foliage. The stems are a striking silvery color. Compact perennial that blooms from mid summer into fall. Grows in zones 4 to 9 in full Sun. Reaching 28 to 34 inches tall. Needs well-draining soil. This is necessary due to the cold Winter months. 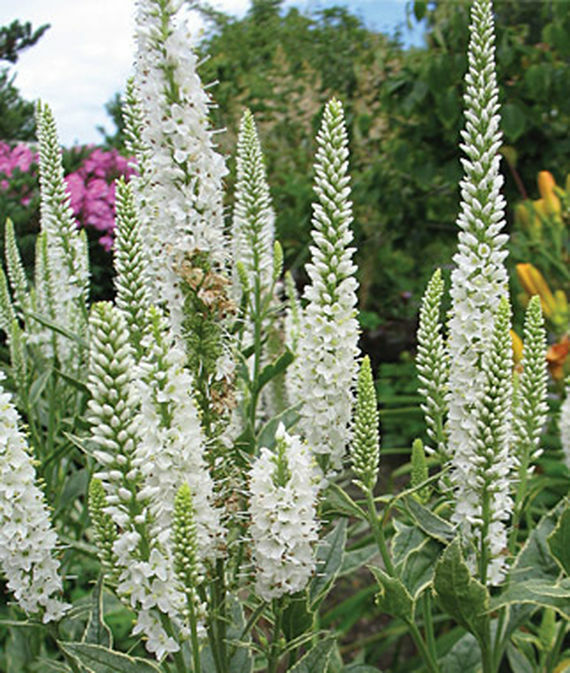 A fragrant perennial that attracts bees and butterflies. Resistant to deer and rabbits. Use in beds or borders and as cut or dried floral arrangements. 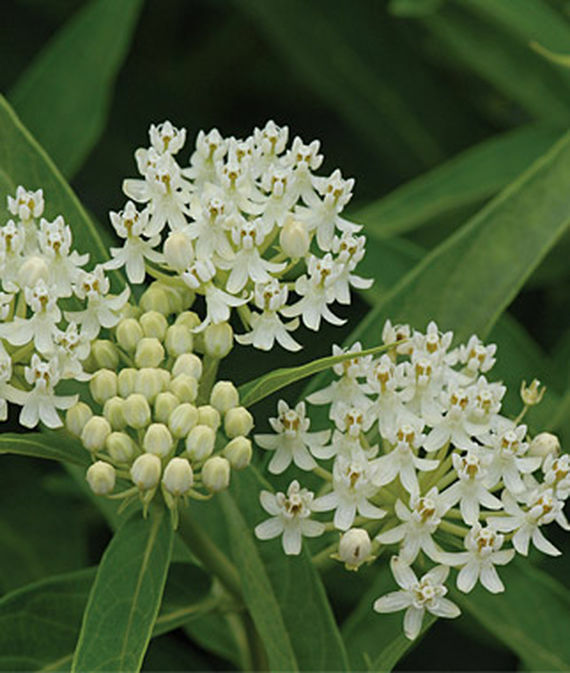 Ice Ballet Asclepias Incarnata or Milkweed has gorgeous cloud cluster of small, fragrant, tiny white flowers. From early to mid Summer, Ice Ballet blooms. Beautiful in a vase. Grows in zones 3 to 9 in part Sun and part shade to full Sun. Reaches 36 to 48 inches tall. Attracts butterflies and hummingbirds. Resistant to deer and drought conditions. Plant Ice Ballet in garden beds or borders. Early Snowball Baby’s Breath has small, double ball-like blooms during the Summer. Grows in zones 4 to 8 in full Sun. Tops out at 36 inches. A drought resistant perennial for use in garden borders. Use in cut flower or dried floral arrangements. The Blanket Flower is also called Gaillardia aristata. 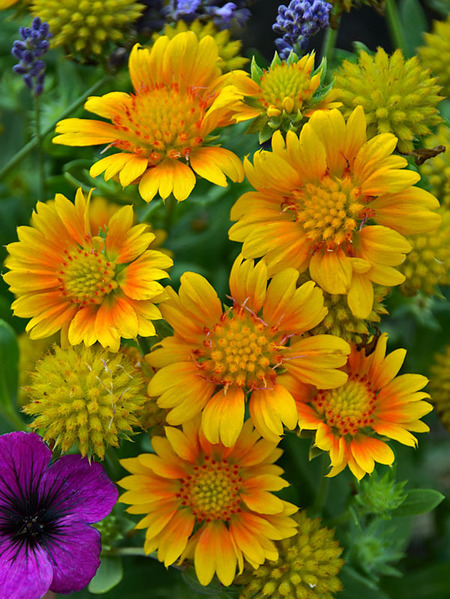 Arizona Apricot Blanket Flower has warm apricot tones with golden yellow tips and a cone center of amber, gold and green. Blooms appear from early Summer to early Fall. Grows in zones 3 to 9 in full to mostly Sun garden areas. Long blooming perennial tops out at 12 inches. Attracts butterflies and is deer resistant. Tolerant of humidity and hot dry sites once established. Beneficial for pollinators and can be used in cut flower arrangements. Another great one of the drought resistant perennials. Coreopsis is also known as tickseed and part of the Big Bang series. 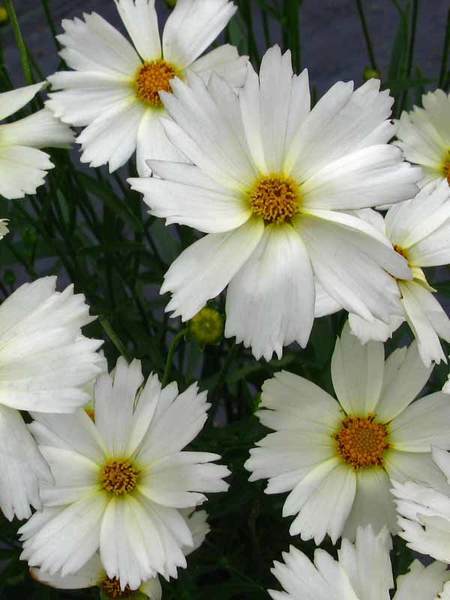 Coreopsis Polaris has snow-white blossoms with yellow button centers. Polaris foliage is dainty, finely-cut foliage that is striking. Blooms early Summer to early Fall. Grows in zones 5 to 9 in full Sun. Reaches 18 to 20 inches tall. Polaris is beneficial for pollinators and attracts butterflies. Long blooming and deer resistant. Plant in a slope or bank and can be grown in containers. Excellent for use as cut flowers. Tolerant of humidity, hot dry sites, and seaside/salt conditions. 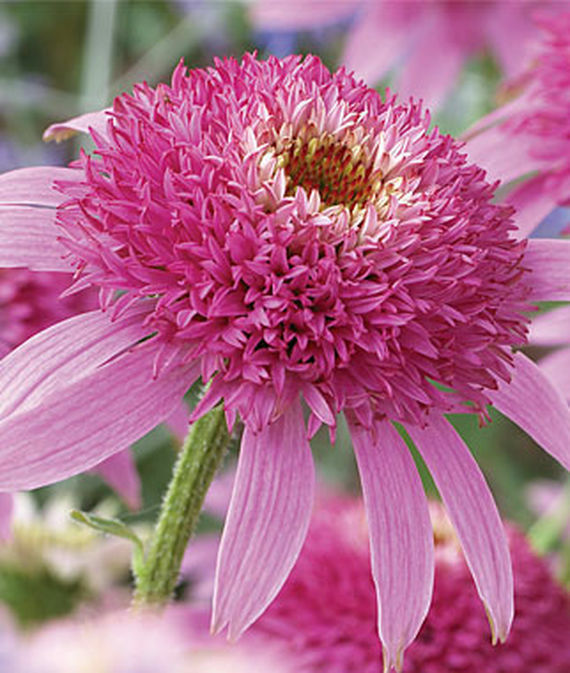 Pink Double Delight Echinacea is also known as a coneflower. Blooms are a gorgeous hot pink. The blooms appear in the Summer through the Fall. Grows in zones 5 to 9 in full Sun. Reaches 24 to 28 inches tall. A compact and upright perennial. Plant Pink Double Delight in garden borders, beds, and use as cut flowers. 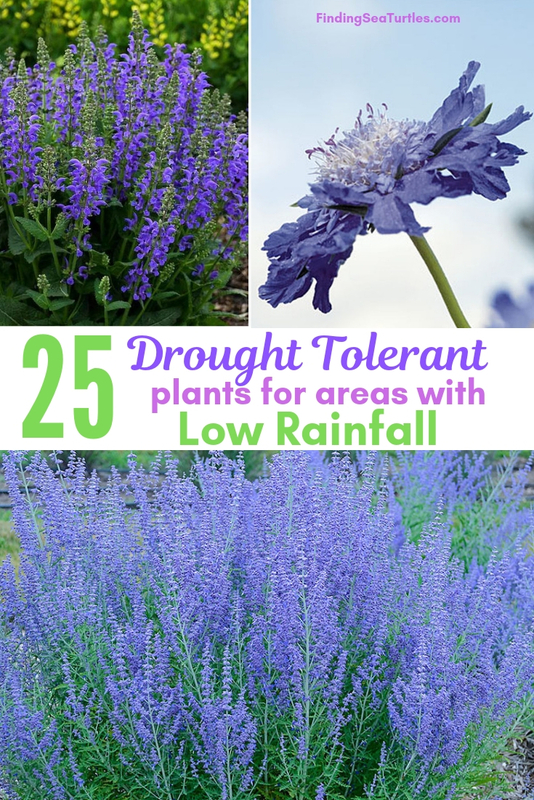 Tolerant of cold, intense heat, and drought. Resistant to deer and rabbits. 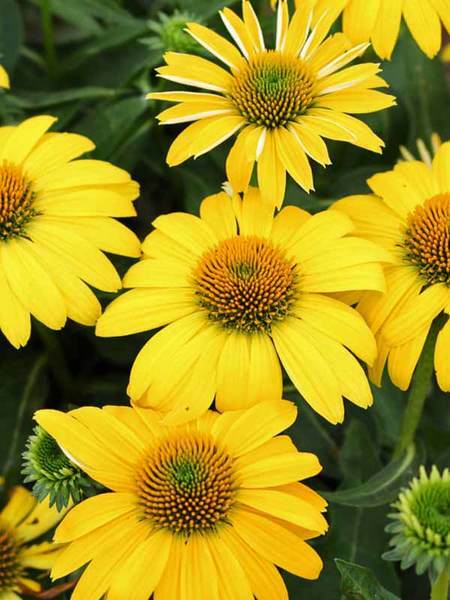 Sombrero Lemon Yellow Echinacea is also known as a coneflower. Lemon Yellow has bright yellow single flowers with golden cones. The vibrant color blooms from Summer into Fall. Grows in zones 4 to 9 in full Sun. Reaches 18 to 20 inches tall. A strong and sturdy perennial. Plant Lemon Yellow in garden borders, beds, containers and use as cut flowers. Beneficial for pollinators and attracts butterflies. Tolerant of heat, humidity, drought, and poor soil. Resistant to deer and rabbits. Long blooming and deer resistant. There are many ways plant Lemon Yellow. Include in a natural meadow, butterfly or pollinator garden, or wildflower garden. Fama Deep Blue has deep blue lavender blooms that appear during the Summer. Lilac-hued double flowers over a dense silver-blue foliage. Grows in zones 4 to 10 in full Sun. Reaches 20 to 24 inches tall. Tolerant of heat, drought, and deer resistant. Plant in garden beds, borders, and can be used as cut flowers. Low maintenance and easy to grow with fantastic results! 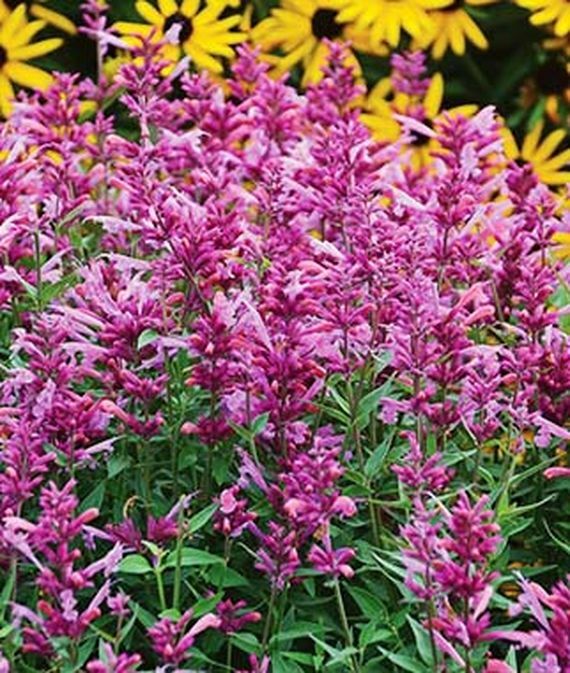 Fragrant Firebird Agastache is also known as Hyssop and Hummingbird Mint. Firebird has copper orange to coral color tubular flowers on spikes. Nectar rich blooms are loved by butterflies and hummingbirds. Blooms from early Summer to mid Fall. Grows in zones 6 to 10 in full Sun to mostly Sunny areas. Reaches 2 to 3 feet tall. Beneficial to pollinators, attracts butterflies and hummingbirds. Both deer and rabbit resistant perennial. Long blooming, plant Firebird in containers for bold color. Drought tolerant with aromatic gray-green foliage. Easy to maintain Sweet Sunshine Heliopsis Helianthoides has yellow flowers that bloom during the Summer. Grows in zones 5 to 9 in full Sun. Tops out at 3 to 4 feet tall! Attracts bees, butterflies, and hummingbirds. 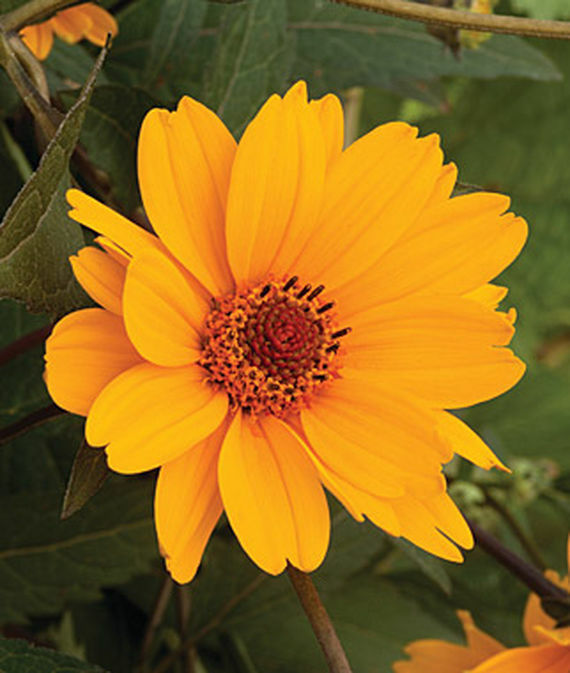 Drought resistant, plant long blooming Sweet Sunshine in garden beds and borders. Makes for an excellent cut flower. Another one of the spectacular drought resistant perennials. Stunning Butterfly Julia Echinacea is also called a Coneflower. 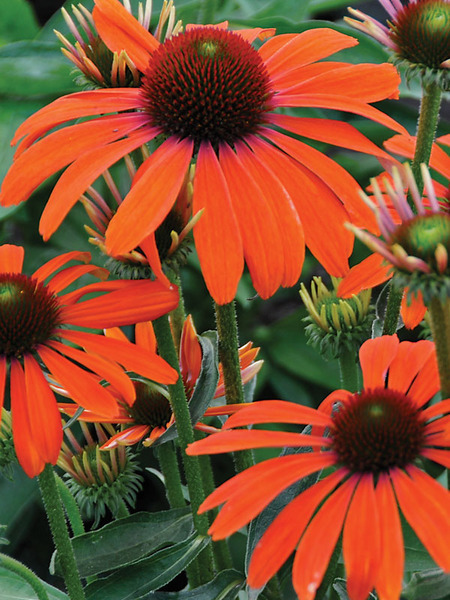 Echinacea Butterfly Julia has bright vibrant orange petals with orange cones. Blooms begin in early Summer and end in early Fall. Grows in zones 3 to 9 in full Sun to part Sun and part shade. Reaches 15 to 18 inches tall. Beneficial for pollinators and attracts butterflies. Long blooming perennial and deer resistant. Plant the compact Butterfly Julia in garden beds or in containers. 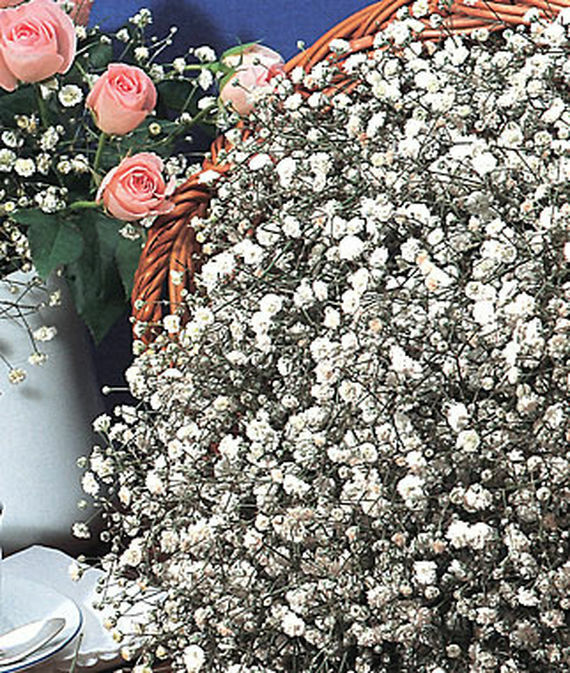 Use blooms in cut flower arrangements. Tolerates humidity, hot dry sites, and clay soil conditions. Named after the Dryas Julia Longwing Butterfly, this fragrant coneflower provides Winter interest in the garden. Trumpet Regale has pure white blossoms on trumpet shaped flowers. Blooms during the Summer. Grow Trumpet Regale in zones 3 to 8 in full Sun to part Sun and part shade. Reaches 36 to 48 inches tall. Tolerant of drought, humidity, cold and heat temperatures. Resistant to disease. Plant Regale in mass plantings. Makes excellent cut flowers. 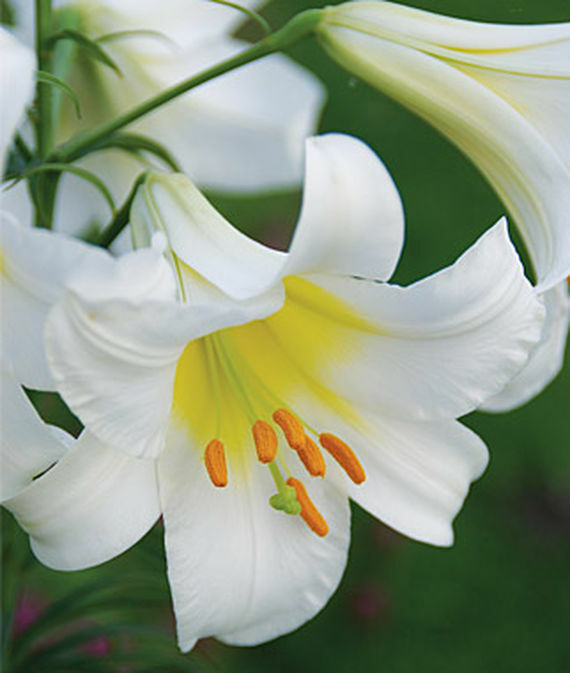 Producing large trumpet shaped blossoms, plants are very rewarding in the summer in the garden itself or the vase. Pure white blossoms are colored light brown outside. 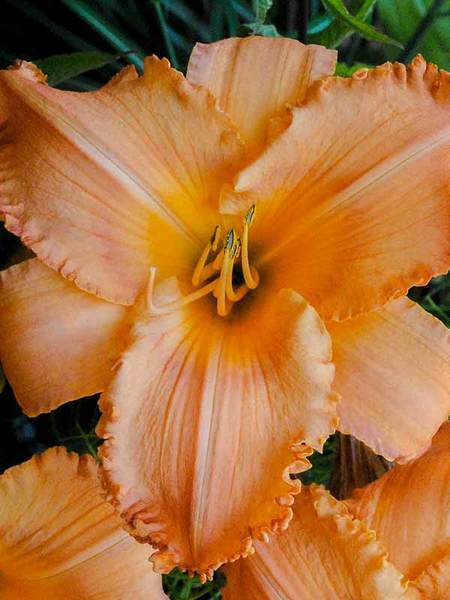 New Tangerine Twist Hemerocallis is also called a daylily. New Tangerine Twist has light tangerine fragrant blossom with a rose tone and golden orange throat. Blooms from mid Summer to late Summer. Grows in zones 3 to 9 in full Sun to mostly sunny areas. Reaches about 33 inches tall. Rabbit resistant, attracts butterflies and hummingbirds. Plant in garden beds and in containers. Tolerant of clay, acidic, and juglone (Black Walnut Tree toxicity) soil conditions. Tolerates hot dry sites, cold, and seaside/salt conditions. 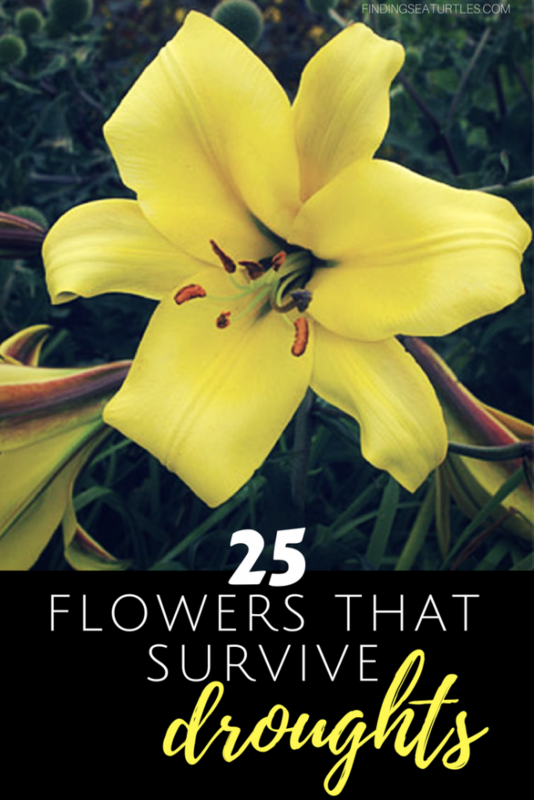 Hemerocallis are tough and drought resistant perennials. Liatris is also known as Blazing Star, Gayfeather, and Button Snakeroot. 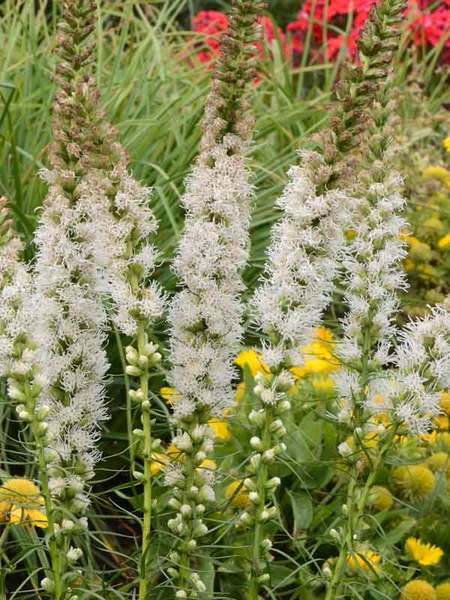 Floristan White Liatris has pristine white feathery spires that bloom from mid Summer until early Fall. Grows in zones 3 to 9 in full Sun to mostly sunny area. Reaches 3 feet tall. Beneficial for pollinators and attracts butterflies. Long blooming and excellent for cut flowers. Tolerant of clay and sandy soils. Tolerates humidity and hot dry site conditions. Drought tolerant once established in the garden. 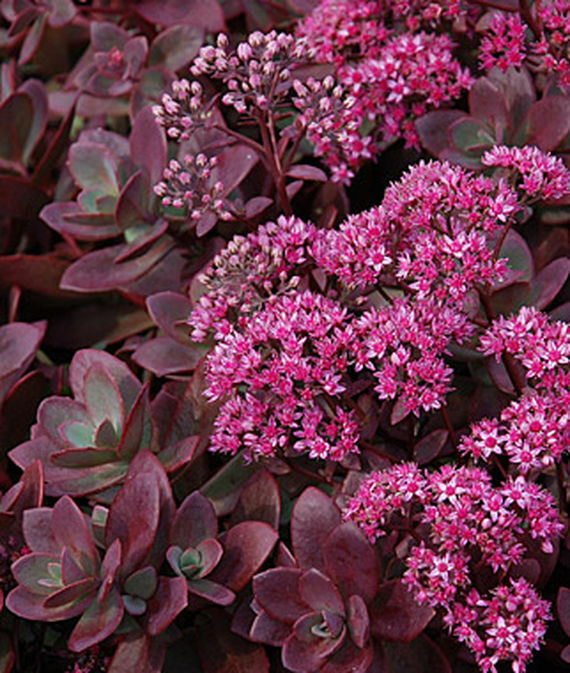 Firecracker Sedum has ruby foliage with hot pink flower clusters. The Sedum blooms over the Summer. Grows in zones 4 to 9 in full Sun. Reaches 4 to 6 inches tall. Attracts butterflies. A low growing perennial, is deer and rabbit resistant. Tolerant of drought and poor soil conditions. Plant as a groundcover, an edger, and in containers. Sizzling color for hot, dry garden areas. Charlotte Veronica has blooms of dense spikes of white blooms. Blooms appear in the Summer. Grows in zones 6 to 8 in full Sun. Reaches 24 inches tall. An upright perennial, Charlotte is drought resistant. Plant in garden beds or borders. Use Charlotte in cut flower arrangement. Another one of many gorgeous drought resistant perennials. Salvia is also known as Meadow Sage. 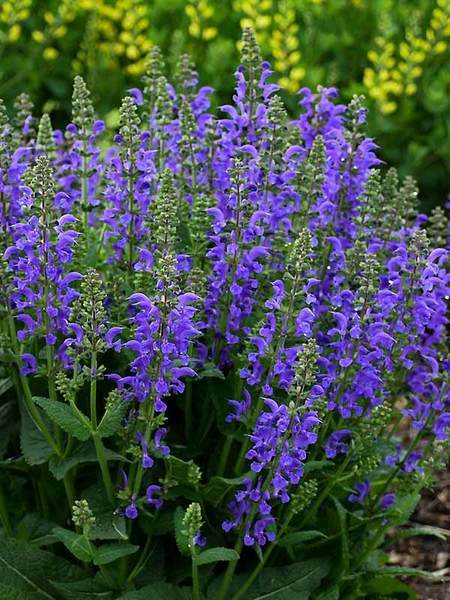 Midnight Model Salvia has vibrant blue flower spikes over dense lush foliage. Blooms appear in late Spring to early Summer. Grows in zones 3 to 8 in full Sun to mostly sunny areas. Reaches 22 to 24 inches tall. Beneficial for pollinators, attracts butterflies and hummingbirds. Deer and rabbit resistant. Tolerates sandy soils, hot dry site and seaside/salt conditions. Long blooming perennial, ideal for cut flower arrangements. Plant in containers or use in slopes or banks. The Flower of Hope Coreopsis is also known as Threadleaf Coreopsis or Tickseed. 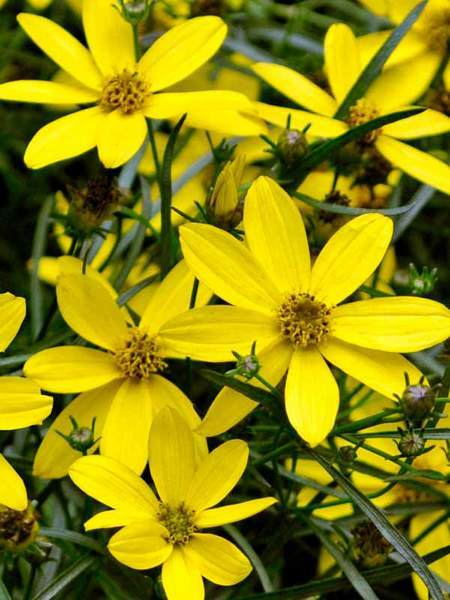 Flower of Hope has bright yellow flowers on blue-green foliage. Blooms appear in early Summer to early Fall. Reaches 18 inches in height. Beneficial for pollinators and attracts butterflies. Tolerant of sandy soils, humidity, hot dry site, and seaside/salt conditions. Long blooming and deer resistant. Plant in containers and on slopes or banks. Great for using as cut flower arrangement. 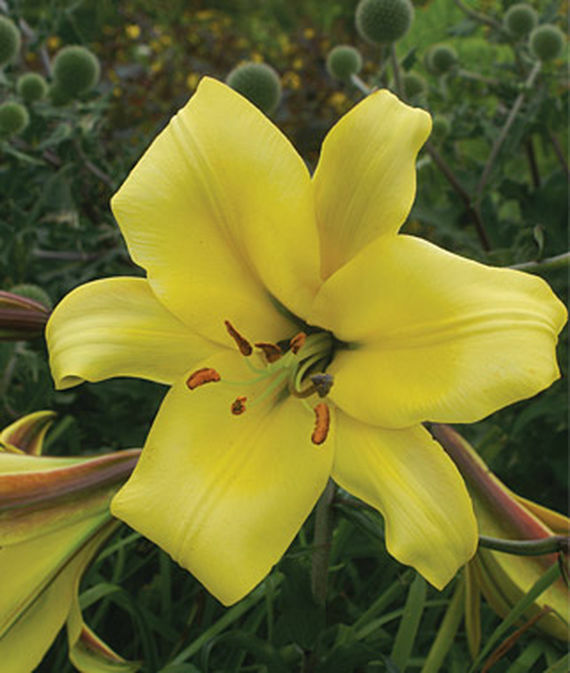 Golden Splendor Lily has golden yellow blooms with deep maroon stripe on outer side. Blooms in the Summer season. Grows in zones 3 to 8 in full Sun to part Sun and part shade. Reaches between 36 to 48 inches tall. Resistant to humidity, drought, cold and hot temperature conditions. Disease resistant too. Plant along garden borders and use as cut flowers. 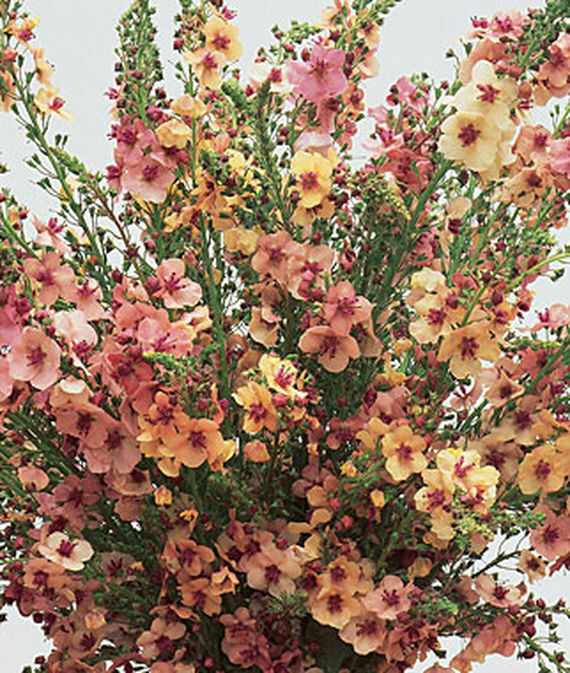 Southern Charm Verbascum has flowers spikes covered with florets in buff, lavender, and soft rose shades. Blooms appear in Spring and Summer. Grows in zones 5 to 8 in full Sun. Reaches 30 to 36 inches tall. Resistant to drought conditions and deer. Plant in garden beds or borders. Southern Charm can be used for cut floral arrangements. Encourage more blooms by snipping spent flower spikes. A cottage garden favorite. 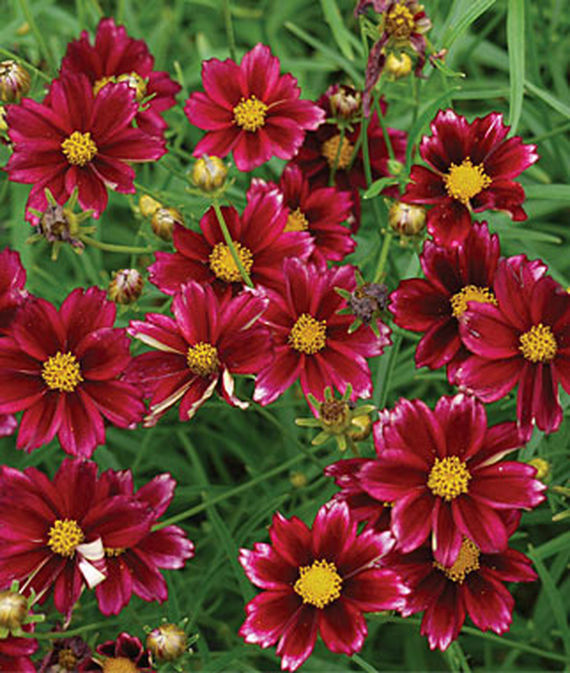 Mercury Rising Coreopsis has velvety wine-red daisies with lightly frosted white tips. Blooms Summer through the Fall. Grows in zones 5 to 9 in full Sun. Reaches 15 to 18 inches tall. Resistant to drought conditions, disease, and deer. Attracts honey bees and butterflies. Plant Mercury Rising in garden beds and borders. Makes for wonderful cut floral arrangements. A low maintenance perennial. Forever Blue Lavandula or lavender has deep blue flowers. Blooms in the Summer and Fall. Grows in zones 6 to 9 in full Sun. Reaches 12 to 14 inches tall. Both deer and rabbit resistant. 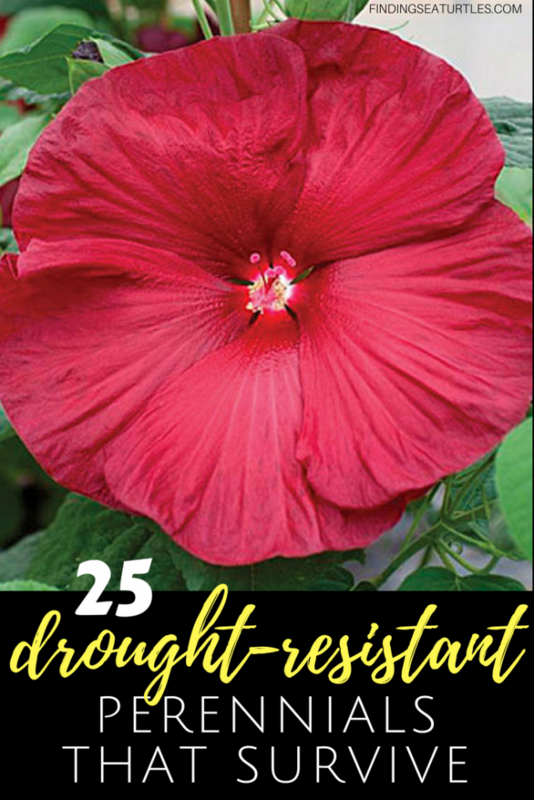 Resistant to poor soil, heat, drought, and disease conditions. Plant in garden beds and borders. Fragrant Forever Blue is harvested for potpourri and sachets. Can be planted in containers. Lavender can be used in floral arrangements or as cut flowers. 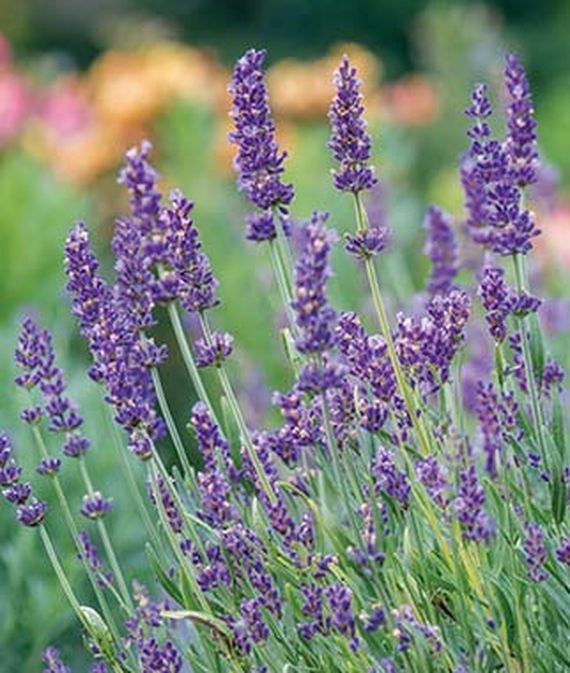 Two lavenders that are hardy from zones 5 to 9 are Provence Blue Lavender and Phenomenal Lavender. 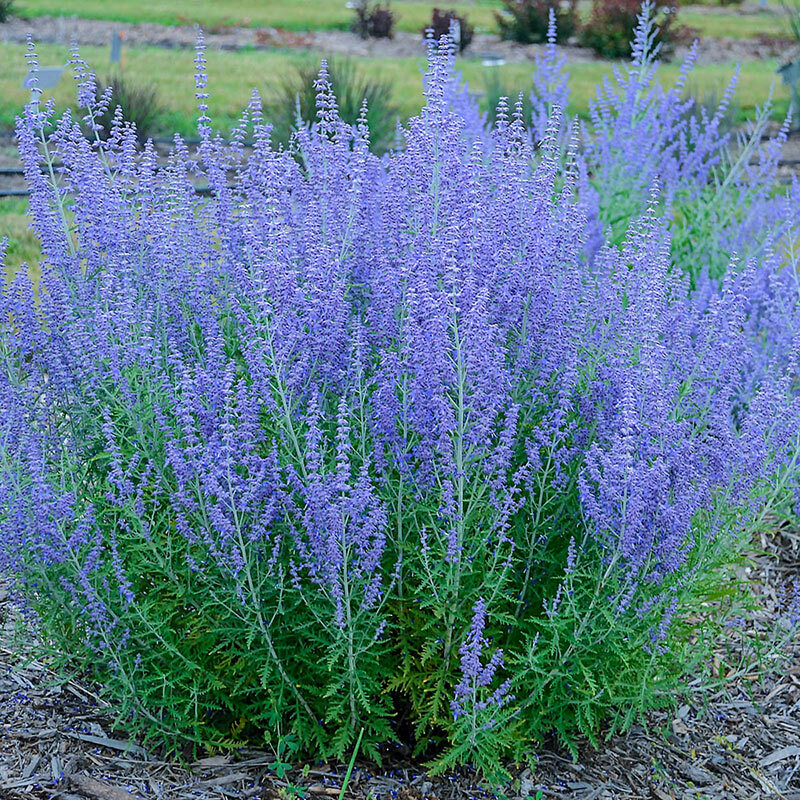 Both Provence Blue and Phenomenal Lavender are drought resistant like Forever Blue. 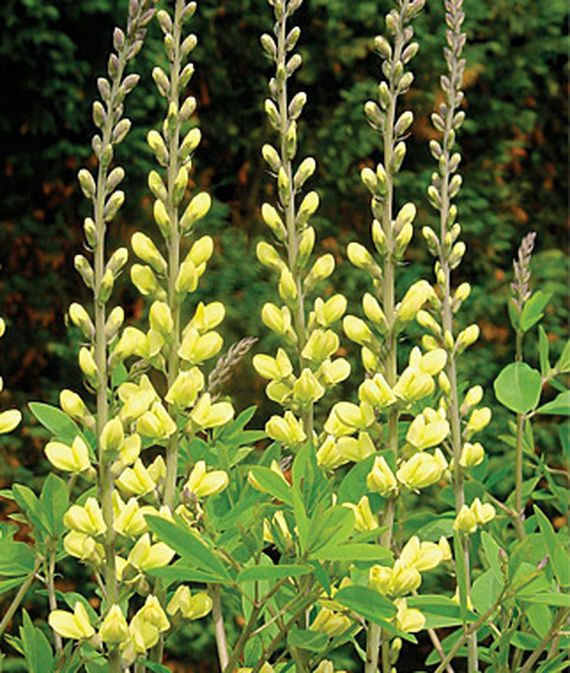 Carolina Moonlight Baptisia is known as a wild indigo. Carolina Moonlight has spectacular butter yellow flowers on spikes. Blooms in the Spring and Summer seasons. Grows in zones 4 to 9 in full Sun to part Sun and part shade. Tops out between 36 and 48 inches. Resistant to drought conditions and rabbits. Plant Carolina Moonlight in garden beds and borders. Use in cut flower arrangements. For adding color to your garden even with a shortage of water, consider planting drought resistant perennials. There are many drought resistant and tolerant perennials available. 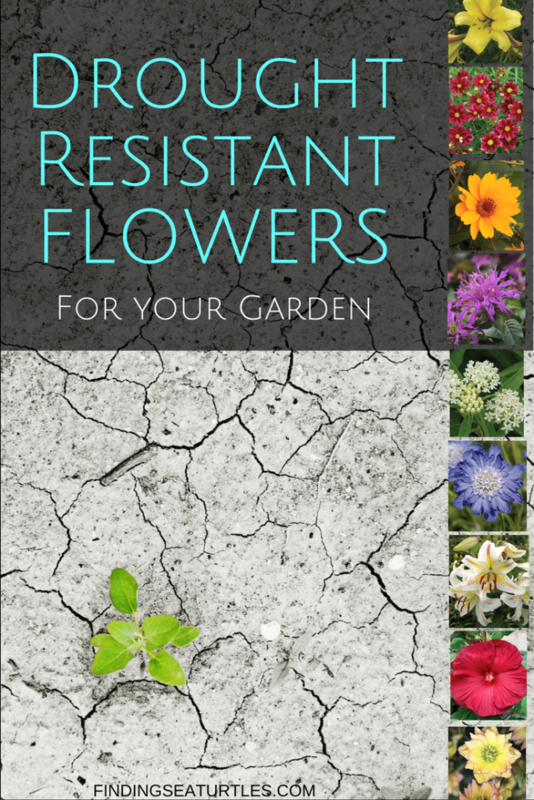 Perennials that provide your garden continuous color throughout the drier Summer season. 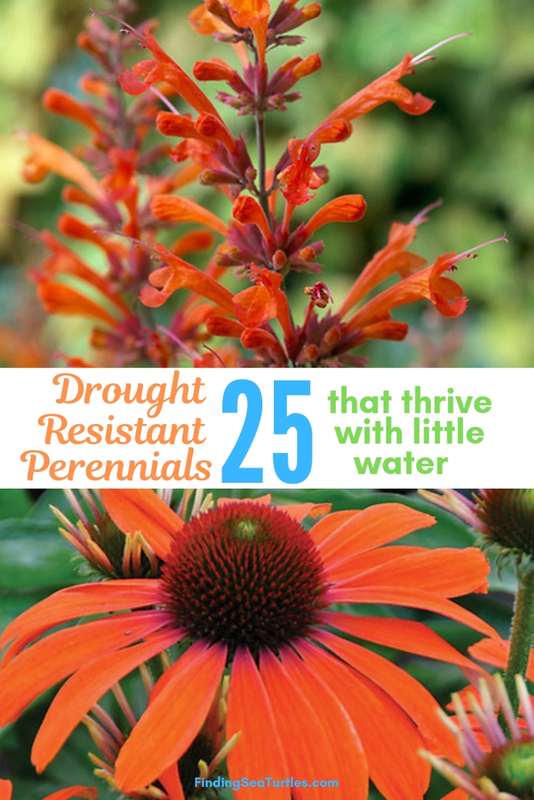 If you give any of these 25 drought resistant perennials a try let us know how you make out. Interested in gardening? If you found this helpful . . .
You May Also Enjoy some of our other gardening related posts. 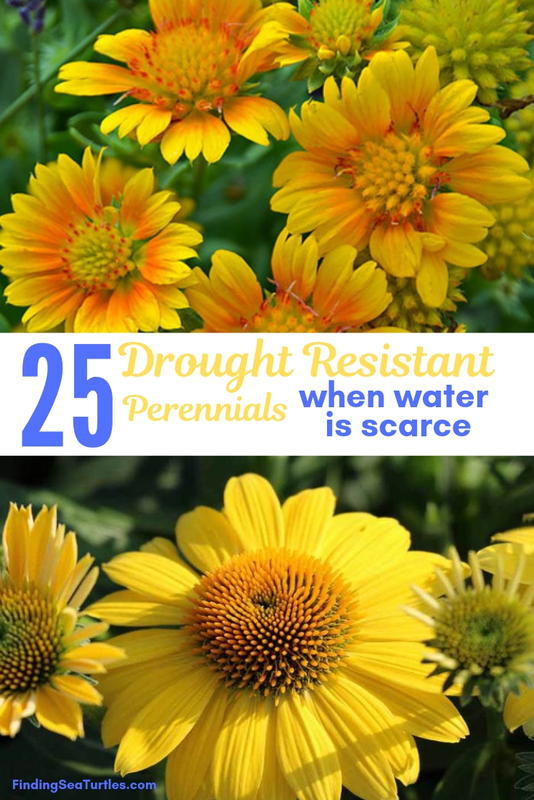 If you try these 25 Drought Resistant Perennials let us know how you make out. And if you have any questions, feel free to reach out to us. We always are ready to help you out. Thank you for visiting. 16 Perennials That Attract Hummingbirds to Your Garden! 8 Gardening Gear Essentials You Need ASAP! like all the deer resistant garden flowers and all the post. Very interesting! I well be interested to know where to find all these plants.